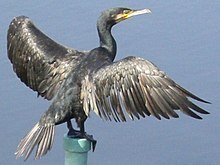 The great cormorant (Phalacrocorax carbo), is a member of the cormorant family of seabirds. It is a large black bird which breeds in much of the Old World and the Atlantic coast of North America. There is a lot of variation in its size in different parts of the world.Weight is reported to vary from 1.5 kg (3.3 lb) to 5.3 kg (12 lb). ↑ It is also known as the great black cormorant across the Northern Hemisphere, the black cormorant in Australia, the large cormorant in India and the black shag in New Zealand. This page was last changed on 4 March 2019, at 14:29.